This Oka family roundtable conversation provided a rare opportunity to hear five siblings in their late 80s and early 90s have a candid conversation about their memories from camp and WWII. While some of what the younger siblings remembered was light-hearted play and the older siblings remembered farming and hardship, all of them remember the residual sadness for what their Issei parents must have gone through, despite never speaking about it. “Papa had it tough. The father of the family, he lost that. Because the family didn’t exist anymore,” says Amos Oka, one of the eldest sons. The family was originally from a Japanese American farming community in San Jose but are now spread out across the country. Flying in from Pennsylvania to Nevada, their return to the Bay Area bookended a somber occasion: The scattering of their older sister Mary (Shiz) and her husband Yutaka’s ashes under the Golden Gate Bridge. As the children and grandchildren recognized this could be one of the last times the siblings might be together and willing to talk, they spearheaded this conversation. Mary’s grandson Casey Coe led the questions while Michael Sera of the Japanese American Museum of San Jose helped moderate. Lily (Yuriko), is the eldest daughter and was born on August 31, 1922 in San Francisco, CA. 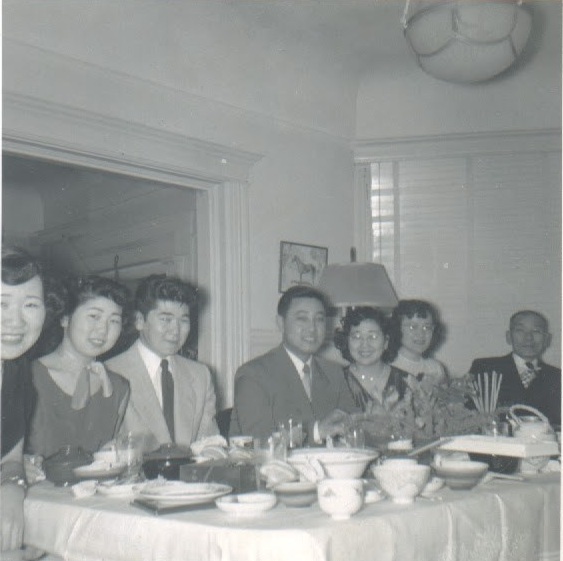 George (Yutaka), the oldest boy, born on August 4th, 1926 in Newcastle, CA. Amos (Kiyoshi), born on April 20th, 1928 in Florin, CA. Eva (Masako) Nakano, born on June 12, 1931 in San Francisco, CA. Jim (Makoto) was born on February 12th, 1933 in Alviso, CA. Robert (Tadashi) Oka, born on December 3rd, 1934 in San Jose, CA. Casey Coe: Before you went into camp, what was life like before the evacuation? George: I was fourteen years of age when they came out with the presidential proclamation. I was attending junior high school and we went from San Jose to Santa Anita and we were there for about three months until they were able to build a more permanent camp for us. And in this case we went to Heart Mountain, Wyoming, which is a pretty desolate country. I think approximately 10,000 people of Japanese ancestry were sent to Heart Mountain. I believe the camp was open for four years, probably? I was there for close to three years, I believe, and I stayed there until I graduated high school at which time I felt that perhaps before being drafted into the army, I would go out and earn a little spending money for myself. So I went to Chicago where my father went to work on the railroad and I went to work in the food industry. I worked there for about eight months or close to year before being drafted into the U.S. Army. CC: [To the younger siblings] Once you were in camp, was it fun? Were you aware of the situation? George: When I went to camp, the big difference between that and San Jose was that our family was decentralized. At home, we were one cohesive unit. But life in camp, our family was spread apart. The children went out to play with other children and the parents had very little control over them. The kids had their own little group. The parents saw very little of their kids. Home was just a place to sleep. We lost that cohesiveness as a family. You’ll probably hear later how they probably formed a gang or a group of their own. I was a little bit more conservative, I would say. CC: So, who was in the gang together? Jim: We didn’t have a gang but I had maybe about five or six people who were my age. I was eight, or nine. So we weren’t too sophisticated, not too strong a gang. But still, we just hung around together and did bad things. CC: So Amos, what were those bad things? Amos: Everything that went wrong in Block 24, was me. I was the so-called gang leader. The number of things that happened I knew nothing about it but the block manager used to say that I did all these bad things to my father, and my father believed it. He blamed me for everything. I was fourteen to seventeen. Eva: Amos was the tallest of this group, so they blamed him. CC: What were some of the incidences you were blamed for? Well, to start with, it’s cold in Heart Mountain. Minus 28 degrees. So we as teenagers used to go to the boiler room. It was too hard to do things outside. They accused me–or my gang–climbing up the thing and going over to the women’s room and watching the women’s toilet. And that was one thing I was blamed for. Another thing, I know for a fact that someone used to punch holes. Everything bad that was happening in the block was my fault. CC: Was there any chance for you to deny that? Amos: No, my father was a tough guy. At least to me. I had no way of talking back to him. He was the typical Japanese father. CC: Speaking of your father and parents, what kind of parents were they, both before and after camp? Eva: They were always working, both of them worked at the mess hall. They didn’t communicate with us. We never saw them. The boys were in one room and the girls were in the other. Not much raising. Eva: And then my father went to work for the railroad, so he left after a while. So my mom was left. Amos: I left early with my father back to San Jose, once they allowed us to go back to the West Coast. My father and I came out and we lived in the San Jose Buddhist Church and slept on the floor of the Methodist Church. Michael Sera: When you came back to Japantown, was it how you remembered it? Eva: You couldn’t get a job. “We don’t hire Japs’ and all that kind of stuff. Eva: Yep. We tried to get a job in the cannery. ‘No Japs hired.’ Anywhere you tried to find a job. Amos: It was an experience. Amos: I went to Cal, got a place, eventually. A lady who had a living room. Diana Tsuchida: Did you ever feel any sense of prejudice before the war? Eva: Well, we lived on a farm with other Japanese people. We were sharecropping. Our whole school, Orchard School on Gish Road, was three-quarters Japanese. CC: What did you grow on the farm? George: Raspberries, cucumbers. I had to wake up at 2 o’clock in the morning to help my father irrigate the raspberries. I was just in grade school. CC: So that’s a very dramatic difference from your life before camp versus in camp. George: One thing about it is that I had to work much harder before camp than in camp. In camp, we never ate any crops. I had it much easier in my case when I was in camp because before, I really had to work my tail off. But in camp I could participate in sports. In one aspect, the younger kids at least, had more liberty and in that case, I can say that I had a better life in camp than before camp. This does not apply to my parents or the older people but in our case, the children, my recollection is that we had it better in camp. MS: When you were in camp did you work? Amos: I drove tractors. I worked in a tire shop fixing tires. I didn’t have to work but I wanted some clothes. You got $12 a month and so you could buy from the Montgomery Ward or Sears catalog. George: In my case I went out of camp and I went to work picking potatoes. And that was hard work. The way they do it is you tie a belt and then you got a hook on there and you get a burlap sack then you get a thing with a handle and you picked the potatoes and throw it in your sack. And we got paid by the sack. We worked for three weeks and we made $17 dollars. Even in those days it wasn’t too much money. And the contract that we had was that there were living quarters with running water which sounded real good but what it amounted to was a one room shack with a wooden table and they had a three chairs, as I recall. And that running water was a stream outside, not running water from a facet. It was hard work. CC: So back in camp itself, what was the food like? Eva: Yuck-o. I was skinny, I couldn’t eat a thing. I used to sneak with my dad to the mess hall and he used to give me all the desserts. It was awful. Jim: A lot of pork chops, I remember. Always a lot of rice. Eva: A lot of stew, dry stew. CC: What was the dining experience was like? Eva: Never ate as a family, we just ate with your friends. George: It was like the army. Did they have a store where you could buy things? Amos: It was a canteen. They would sell smokes, candy. Eva: If you worked there you would get $16 a month. CC: Speaking of disparity with wages, how were you generally treated by people who were contracted to work in the camps? Eva: Guns on you all the time. You guys [to the brothers] went out of camp one time, out of the barbed wire. We used to go out there and swim and everything. George: I think they knew we couldn’t go very far. But we had freedom to go all the way out to Heart Mountain if we wanted. CC: Did you have to be escorted if you went out that far? You just went out there? Amos: It snows a lot in Heart Mountain so kids like to do snow things. We made sleds out of two by fours. So one day it was nice, there were no hills inside the fenced areas but there were a lot of hills outside. So we went under the fence and we were sledding. So there’s a guard tower out there and he sees us doing this thing, calls up headquarters and a whole bunch of guards come with fixed bayonets. Again, as I was the gang leader, the soldiers marched us all the way to the guardhouse with fixed bayonets on our backs. We stayed in the guardhouse and we missed dinner and they called the block manager and he had to pull strings to release us. These two guys know [to Jim and Tad], they were seven years old. CC: As a seven year old, was that scary for you? CC: Did they treat you any differently after that? Did they single you out? Amos: Security was pretty tight in camp. They’d sweep the camp with searchlights every night. Eva: I was in Girl Scouts and they let us out for a week to go to Yellowstone. It was still Heart Mountain so we were able to get out with permission. We were able to talk to the people in Cody, Wyoming and we were able to write letters. CC: Did any of you ever feel scared? Eva: Santa Anita, there was a riot once. We had to run for our lives back to our barracks. CC: Can you talk more about the conditions there? Eva: I remember cars going up and down at midnight, they had a show of force. It was okay except for the riots. Amos: When we went there, Mr. Zanker (of Zanker Road) took us. He was friends with my father. He took us to the railroad station in San Jose. We took the train to Santa Anita. When we got there, they gave us sacks. And they said, “Go over to the parking lot over there and put straw in these sacks.” That’s our mattress. Another thing I remember was that we lived in a parking lot but others went to the stables, and my friend was there. Horses used to live there and it smelled like hell. I remember that vividly. Amos: Because of this Korean got beat up, there must have been some conflict with people in the office. And so with this they had troops marching in, with fixed bayonets. And armored cars, twenty four hours a day, with searchlights. And at the post office they had a guard, soldier with a rifle. So all of this made me hate the whole thing and felt they were taking my rights away. I felt old enough to feel that way. All my normal U.S. citizens rights were taken away from me, just for what? Japan went to war with America? I wasn’t Japan Japanese. We were Americans. That’s what I really resent. CC: Did the rest of you have similar sentiments about that? Eva: Yeah, all three of us. George: We were too young, I think. To have that more mature thought. Robert: The caucasian people that we knew came to visit us in Santa Anita but they had to speak to us through the barbed wire fence. CC: Who were these friends from San Jose? Eva: The Zankers. My dad used to work with Zankers. George: We lived in the house they owned, our father used to work pruning their orchards. Eva: In camp he sent us a box of pears. Amos: So I resent the whole thing, and I’m a minority in that thinking. Eva: We had fun playing. I think mom liked it because she was working so hard before the war. She was able to do lots of stuff. She was able to join groups and do sewing. Amos: But Papa had it tough. The father of the family, he lost that. Because the family didn’t exist anymore. I hated to be him, having to go through all that. And from a psychological point of view, from a monetary point of view, he lost all that work. Eva: After the war it was bad again because Mom had to work and catch up and farm. CC: Did he ever discuss that with you? Amos: We didn’t communicate much. I used to communicate with my mother, but not my father. George: There was to a certain extent, extenuating circumstances. But it was unjust, no question about that. And the Isseis really suffered. I didn’t think the Niseis suffered as much at that particular time. MS: When the war order came out, what’s the thing you remember the most? Eva: Getting rid of all the bicycles and everything we owned. That was sad. Amos: My father had lots of tools and my mother just got a washing machine. And my father just got a new car, he had just bought a new Ford. And what I call the white trash, they came and they don’t even ask my father if they can look. I think my father bought the car for $900 and something. They offered for $300 for the new car, he just got it. Washing machine, my mother never had a washing machine. And again, my folks had no recourse because if they didn’t sell it, what are they going to do with it? I recall that very vividly. I hated it when people just come and go through things and they can make a ridiculous offer. That kind of thing really got me. I think I was prone to this kind of thinking. CC: It was a formative time in your life for something like this to occur. Amos: I think so, I had strong thoughts about these things. [To the siblings] Much more than you guys, you were too young. MS: You experienced all of these things, but you’re still a strong American. Amos: I was educated here, I worked here, what can you do? I am a strong American. MS: Other people might have taken a different stance or approach. So that’s very admirable. Amos: I didn’t hate the government, or the U.S. I hated this situation. CC: Do you think there are lessons to be learned from that time? George: We just don’t want it to happen again. Amos: It’s been determined how wrong that was, already. It will never happen again, I doubt it very much. I’m too old for it. MS: What about your grandkids? Amos: It’s up to them to fight it, if they believe it.